Platinum Data or プラチナデータ (2013) is based on work by Keigo Higashino who’s usually very reliable as a provider of source material. This first appeared as “Platina Data” which was published as a serial by Papyrus in 2006, and was later fixed up as a novel by Gentosha and published in 2010. I suppose I might be inclined to think the film of some value if I had not also seen Minority Report (2002), another science fiction film, albeit set in the year 2054. Just to remind you, the technology at the heart of this earlier film is that three precogs are slaved together to predict when a murder will occur. The police are then able to intervene and prevent the killing, consigning the murderer (guilty in mind only) to a deep-sleep jail. The theme of the film may rightly be characterised as a meditation on the relationship between determinism and free will. So this film is set in Japan in 2017 and it has an all-singing, all-dancing computer system going through beta testing. It predicts both physical characteristics and behavioural patterns based on an advanced form of DNA analysis. If the tests are successful, the government has pledged to pass legislation authorising the collection of DNA from all Japanese citizens. Even babies will surrender a sample to ensure the database is kept up-to-date. Once the collection is complete, the quality of the data will represent platinum status, i.e. the computer’s mathematical models will be able to use any trace DNA to identify the probable offender. Although the police force will not become redundant, the investigation of all serious crime will be handed over to the machine. Enhancing the DNA capacity, there’s also a facial recognition system so that individuals may be tracked through the thousands of surveillance cameras placed throughout public spaces both outside and in common areas inside buildings. Once a suspect is identified, the system can guide the police to arrest him or her. The assumption is that the DNA predisposes the body to grow in particular ways and for the personality to have certain predictable traits, i.e. it’s a determinist system. This fairly quickly looks a shaky proposition because once the system enters testing, there are thirteen instances where the DNA found at crime scenes cannot be identified. One of these crimes is a serial killer and, when the killer strikes again, the DNA found under the fingernails of one victim, Saki Tateshina (Kiko Mizuhara) proves to be that of Ryuhei Kagura (Kazunari Ninomiya). These are the two people responsible for writing most of the code for this DNA computer system. 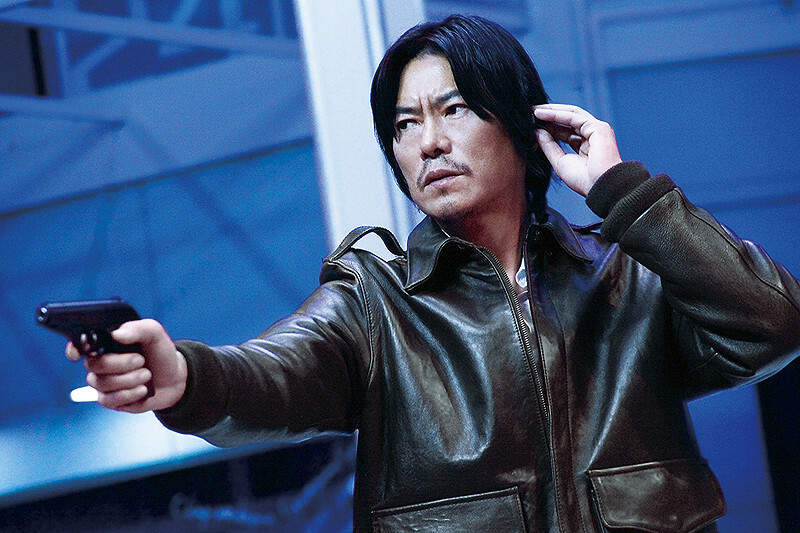 Detective Reiji Asama (Etsushi Toyokawa) is immediately suspicious. This killing does not match the others in terms of motive, nor is there any clear reason for one of the two brilliant coders to kill the other. But, as is always required in this type of film, Kagura goes on the run and we’re subjected to several rather tedious chases. For the record, the two coders met in hospital. One was an idiot savant. The other was suffering multiple personality disorder following the suicide of his father. If you should decide to watch this movie, then remember the point of Minority Report. One of the precogs has an agenda which was to expose the murder of her mother. So this “trio” of personalities also proves to have an agenda. Yes, there’s a problem with the design of this system and perhaps, just perhaps, the DNA analysis is not infallible. Perhaps people are able to act outside the predicted behavioural parameters if the circumstances warrant it. Or there may be a different problem. If I was feeling more benign, I might dignify this as a more dystopian film. At least the government in Minority Report might have been altruistic in its intentions. This means you only watch the rather tedious and predictable Platinum Data or プラチナデータ if you want to see some quite pleasing future computer systems in operation and some cool locations. The look and feel of the graphics is pretty good. It’s a shame the plot proves so derivative and undercooked. Perhaps it reads better than it looks. For a Galileo novel, see Salvation of a Saint. 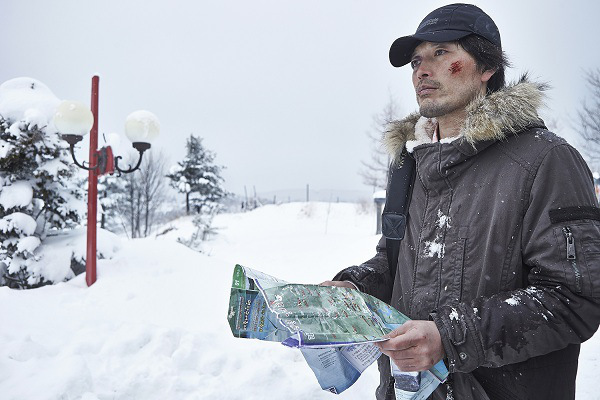 Midsummer Formula or Manatsu no Houteishiki or 真夏の方程式 (2013) sees us continuing the saga of Professor Manabu Yukawa (Masaharu Fukuyama) aka Galileo. 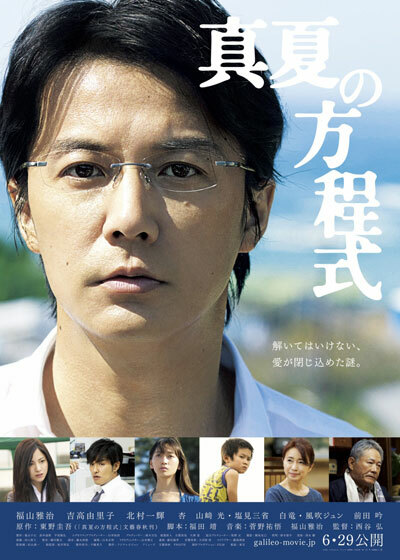 This is based on a novel by Keigo Higashino published in 2011. Misa Kishitani (Yuriko Yoshitaka) is back in the saddle as the token detective and Shunpei Kusanagi (Kazuki Kitamura) lurks in the background to give the couple official cover as they navigate tricky waters. Thematically, this is a story about two children. Now grown up, we start with Narumi Kawabata (Anne Watanabe), while Kyohei Tsukazaki (Hikaru Yamazaki) is still young and goes through a crash course of how to lose your innocence without understanding exactly what’s happening. Galileo has been invited by Submarine Mineral Resources Development to conduct an underwater survey in the sea off the picturesque fishing village of Harigaura. The entire project is opposed by the majority of the village, led by the vocal but not very logical Narumi Kawabata. By coincidence, Galileo is staying in the small hotel run by her parents. On the train to this holiday destination, he encounters Kyohei Tsukazaki. He proves to be the nephew of the couple who run the inn. This brings all the key players to the same place. Everyone who has read or watched the adaptations will know Galileo is allergic to children. He finds their inability to think in a coherent and logical fashion so difficult to cope with, close contact brings him out in hives. However, this boy’s rather more engaging personality seems to make him acceptable to the professor. As a result, he sets out to show this naturally sceptical boy the virtues of a scientific approach to the solution of problems. In this case, the challenge is to give the boy a clear view of the life underwater not less than 200 metres from shore. The way in which Galileo solves this problem is both elegant and educational. Even the stubborn boy is forced to concede the results of the experiment are beautiful. However, this all comes at a difficult time for the hotel. One of the other men staying at the hotel has apparently fallen to his death from a nearby breakwater. However, when the results of the autopsy come back, it seems the man died of carbon monoxide poisoning before he hit the ground. This gives the professor the first part of his challenge as a detective. How can a man be gassed in the open air and so “fall” to his death? The police naturally research the background to this suspicious death and discover that he used to be a senior detective in Tokyo Central. This triggers official interest and when Galileo is also found to be a guest at this hotel, Shunpei Kusanagi sends Misa Kishitani to find out what’s happening. During his professional career, the dead man was most interested in a stabbing case which occurred in 1998. He was never satisfied that the man who came forward to confess was actually the killer. But when the man produced the bloody knife and other evidence, the courts confirmed the conviction and he has spent the intervening years in jail, only recently being released because he’s developed cancer of the brain and will soon die. Galileo is fascinated by the question of why this retired detective should also have been in the same hotel and delegates the task of a detailed background investigation of the family to Misa Kishitani. This sends her back to Tokyo and leaves the professor quietly looking round the hotel with the assistance of the boy. As a result of the professor’s second demonstration to the boy of a scientific truth over dinner, the father realises the professor is on the right track and so goes to the police to confess an accidental death in the hotel and the attempt by he and his wife to cover it up. Obviously, it’s bad for business if guests are reported dying of carbon monoxide poisoning in their rooms. At first sight, the police are inclined to think this a credible explanation for what happened. The professor, however, urges Tokyo to redouble its efforts to investigate this murder of 1998. Indeed, in due course, the professor goes to see the man who confessed to the crime and is now in a hospice waiting to die. This leads him to make a number of decisions about how best to proceed. As you would expect, both the death in the hotel and the earlier murder prove to be interesting cases. But at the heart of this film, the issue is the innocence of childhood and the choices that affect them. In this instance, the problem for Galileo to solve is social rather than a simple matter of physics. The murder of the woman in 1998 resonates today and is the direct cause of the retired detective’s death. But digging out the whole truth of both events could have very unfortunate effects. It’s therefore left to the usually indifferent professor to craft a solution to protect those who should be protected. This matches a similar dilemma in Suspect X (2008) but the difficulty is heightened in this case by the unexpectedly close relationship that grows between Galileo and the boy. As adults, we’re expected to take responsibility for our actions. But as children, their intellectual and emotional development is limited. Consequently, they are not supposed to be capable of distinguishing between right and wrong. Others therefore take decisions on their behalf. As a physicist, Galileo surveys the bottom of the sea off the coast at Harigaura. It’s not for him to take the decision whether to exploit any of the resources he identifies. He presents his findings. It’s then for Japan to balance the need for those resources and the economic benefits they would bring to the country, against the need to protect the environment for future generations of Japanese to enjoy. These are not values he feels he can assess — mathematical formulae cannot resolve complex social and economic issues. When it comes to children and the decisions taken on their behalf, Galileo faces a comparable difficulty. It’s not for him to impose his choices on others. They must find their own paths. But when young, they are not competent to take those decisions. So the best he can do is protect them in the initial stages until they can ask the right questions, elicit the appropriate information, and then choose the path that’s right for them. He approaches this task in a completely unsentimental way. No matter what his personal feelings, he holds himself to a higher code. In the end, it’s for each individual adult to make an informed decision and take responsibility for its consequences. Slightly less frequently for a murder mystery film, this provides an interesting political and social subtext and gives additional power to the film. Although it’s slightly more measured and slow in its build-up than other adaptations of work by Keigo Higashino, this proves stronger because of the care taken to set the scene and allow the characters the room to develop. Hikaru Yamazaki as Kyohei Tsukazaki is particularly impressive as he slowly comes to recognise what the adults around him have been doing. There’s a moment of real sadness at the end when he suddenly understands how little in common he has with his father. Yet there’s hope for him because he may be deciding to treat Galileo as a role model. When growing up, I played what approximated to tennis. Even with a tall wooden fence built around two sides of the court, the effects of the prevailing winds were sufficiently strong and inconsistent that players needed supernatural abilities to predict where balls in flight would land. These were the days before climate change. The wind blew from the North Pole keeping us cool during the summer and under six feet of snow during the winters. This means a special place in my heart for the anime series Prince of Tennis or Tenisu no Ōjisama or テニスの王子様. I think I managed to sit through all the episodes up to Seishun Academy winning the National Middle School Tennis Championship. I showed such fortitude not because I’m a fairweather fan of tennis as a game, but because I find the fusion of fantasy and sport fascinating. The manga and subsequent anime adaptation were written in the days before Kei Nishikori managed to get into the top ten of the world ranking. Were people sitting down to write a tennis-based story today, there would be no need to show players developing and relying on supernatural abilities to win. Local players would simply be the best in the world. Except, of course, Prince of Tennis is not alone in suggesting the top exponents in any activity do not rely on skill alone to excel. In one way or another, all winning players or fighters have inner physical and psychological strengths that enable them to outperform all opponents. That’s why we have the thread of wish-fulfillment running through this art form in which the young are shown defending the world, Japan, and their homes through the strength of their willpower as manifested through the machines they use or the sporting paraphernalia they play with. If passion was the only requirement, these young adults would win at everything whether it was a card-based game or battles against monsters. So here’s me sitting down to watch the live action version of Prince of Tennis (2006). It’s one thing to watch fantasy when it’s line drawings filling the screen, but quite a different kettle of fish when it’s portrayed as “real”. The moment a camera shows an actual human being doing stuff, the credibility problem rears its ugly head and I start looking for some level of plausibility. 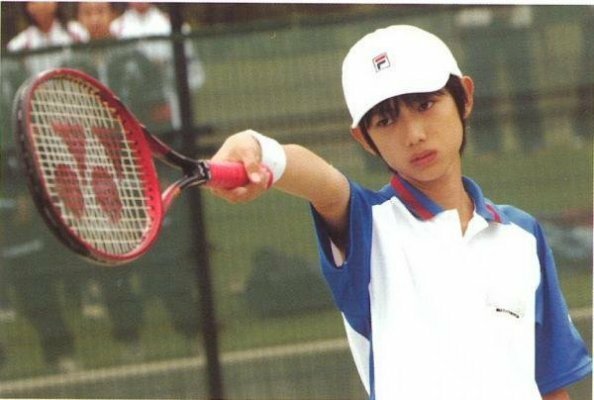 As in the manga and anime, this version of Ryoma Echizen (Kanata Hongô) starts off with the inherent advantage of being ambidextrous. Because he can switch hands, he has a better coverage of the court without having to run as much. In the anime, his father is distinctly odd in a not very pleasant way. The film version has him almost human but nevertheless intensely lazy, being able to win without seeming to exert himself. This is a source of intense frustration for Ryoma and, to a degree, explains why he has such an arrogant approach to the social world as a deliberate loner. He’s far better than most other tennis players regardless of gender and age. He doesn’t have to like anyone else to beat them at the one game in which he wants to excel. Except he can’t beat his father. This gives him a major chip on his shoulder (big clue as to the theme of this series and film: he can never beat his father at his own game, he has to develop his own playing style and strategies, and play that game against his father). The film version is remarkably faithful to the anime in the set-up with Ryoma feeling betrayed by being called back to Japan by his father, contemptuous of most other tennis players, but slowly coming to realise there can be advantages to being a team player. This is symbolised by Kunimitsu Tezuka (Yû Shirota), the school team captain, who beats Ryoma in a private game and later plays on in a key match even though he has a seriously damaged elbow. Sacrifice of oneself for the benefit of individuals or the team is one of the messages of this series. To produce a two-hour film out of hours of manga and anime plot requires selectivity, so we watch Ryoma arrive at the school, beat a few of the top players without breaking sweat, and then playing his first match. The match the film director picks has Ryoma damage his eye. He then has to win “in ten minutes” or forfeit the match (don’t ask, it’s just a silly plot contrivance). This is also physically absurd. Monocular vision does not a good tennis player make, no matter which hand he uses to hold the racket. Anyway, he’s sufficiently impressive to be accepted as first reserve on the full team and this brings us to the “big match” where he has to play the bully. In the anime, there’s a big lead-up to this match which is won on the final shot where, after an interminable exchange of ground shots, each one more ferocious than the last, Ryoma produces a drop shot that leaves his opponent humiliated and defeated. This real world match is hilarious. The arrogance of the bully is wonderful and, when Ryoma shows he’s not an opponent to be easily dismissed, the bully shows his supernatural talent. Now whereas others have trick shots which bend the ball in the air like an arctic gale suddenly appears or the ball disappears once it bounces (it’s the spin that takes the ball in an unexpected direction), this guy controls the solar system. Yes, when he gets angry, he produces a solar eclipse. Fortunately, the competition organisers have seen him do this before, so they are ready to switch on the massive lighting arrays to permit the players to continue the game. The bully now targets Ryoma’s leg, consistently hitting it with high-powered shots. Our hero’s head drops. His leg is bruised and hurts. More importantly, his understanding of astronomy has been seriously disturbed. Can he reset the celestial machine and rebuild his self-confidence? You betcha! He hates to lose so, with a contemptuous flick of his racket, he swats the moon away from the sun, the match organisers can turn off the lights before the money in the power budget runs out, and our hero outhits the young professional to win the match. Yeah! The film’s attempt to be original with the subplot element of the dumb girl is rather wasted, and the token appearances of the other team members underwhelms. I suppose there could be sensible films in which magic or supernatural powers of one sort or another could be interwoven into a gaming format. Although I always thought the film version of quidditch rather confused and some of the wizard battles in other films have been distinctly silly, there’s probably room for a Tomorrow People type show in which individuals with telekinetic powers play each other at various ball sports. 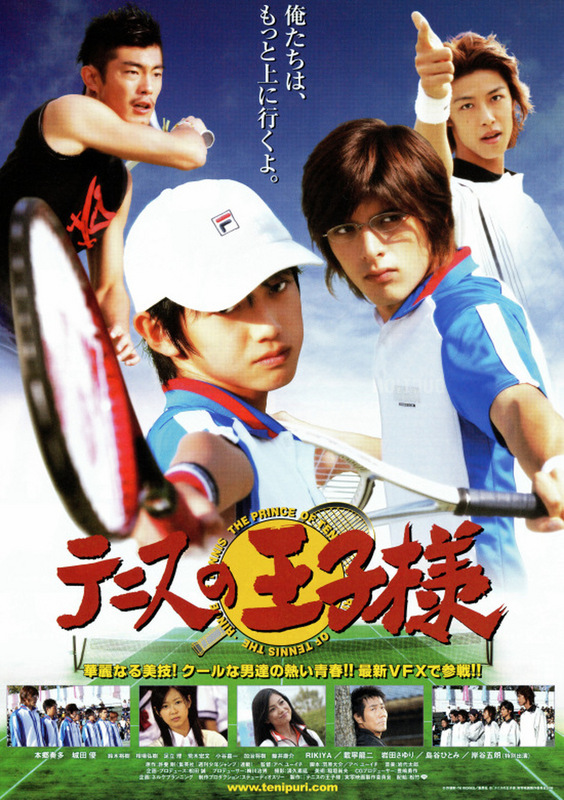 Until that day arrives, you should stick with the anime version of Prince of Tennis. Once you see human beings using magic to play tennis, it just gets too absurd to be watchable. Veronica Mars (2014) is a most curious example of wish-fulfillment. Those of us with memories like an elephant — sorry that simile doesn’t quite work in this instance because elephants don’t watch television shows. Those of us who can remember back to 2004. “Hey man, that’s like ten years and so passé. Who’d want to remember something from way back when?” Well, this is Rob Thomas and here’s a Kickstarter riposte to those executives in the movie-making business who don’t think there’s mileage in a cult television show for a sequel, but are prepared to spend millions of dollars in remaking The A-Team or, worse, Dukes of Hazzard, Land of the Lost, etc. Personally, I’d like to see a film based on Pushing Daisies but my eccentricity in matters of taste is notorious. So, after a brief moment watching our heroine being interviewed by a top New York law firm and living with Stosh “Piz” Piznarski (Chris Lowell) here we are back in Neptune, California with Kristen Bell as she slips seamlessly back into the character of the obsessive investigator who got her full PI licence when she was still at school. She’s responding to a call from Logan Echolls (Jason Dohring), who’s now a member of JAG — obviously a man who knows where he’s going so long as it’s by sea. He’s accused of murdering Carrie Bishop who had made a name for herself as a pop diva calling herself “Bonnie DeVille” (ah, what’s in a name). As with most people accused of murder, he needs some help. Naturally, Veronica opts out of the whirlwind of job interviews to fly out to renew acquaintance with her father, Keith Mars (Enrico Colantoni), and the other stalwarts from her youth. Insofar as this is a film made using fans’ money, the question we have to answer is whether the film is better than the average bear, or something that will only appeal to the diehards. Writing this at the end of the first week in the cinemas, the answer would seem to be limited appeal in the general marketplace. The gross take is edging up to $2.5 million. But the wrinkle we can’t get beyond is the number of people who opted for home viewing. The whisper is fairly positive and Rob Thomas says the early signs for a second film sequel are encouraging. It may well be this turns into a franchise despite the apathy of the power-brokers in Hollywood. To achieve this no doubt worthy aim, the appeal must satisfy two completely different demographics. When it was being broadcast, it routinely picked up around 2.5 million viewers across three seasons. Whatever sequel is made must satisfy the natural desire of the fans to catch up with as many characters from the series as possible. To that extent the film succeeds as an exercise in nostalgia. Nine years have passed and people may have aged, but the high school reunion brings all the cast back together and provides a vital photographic clue from the past as to the motive for the most recent death. Indeed, as we wander through Neptune, interesting faces resurface, often saying “significant” things for the fans (and for solving the murder). As to the mystery plot, it’s faintly amusing to see Veronica pull out her old box of PI stuff and have to make do with out-of-date tech. Indeed, her general lack of awareness about the cultural life of the city and its radio stations, is almost the death of her. But the mystery element is a little thin. There’s remarkably little set-up for the murder itself. We don’t get to walk through the scene of the crime or to have someone explain the gatehouse system which suggests Logan was the only one who could have committed the crime. Although this comes out as we get into the second half of the film, it’s always better when we viewers have a clear view of the problem to be solved from the get-go. As one of the attorneys says when Logan is looking for someone to represent him, he needs a viable alternative explanation of who could have done it. This is difficult to formulate without a proper set-up. Even when we have a reconstruction flashback, Veronica’s guess is actually wrong. At the end when we know whodunnit, we’re still left guessing whether her suggested method is correct. Indeed, the ending sequence is a little undercooked. There’s a confrontation, admissions are made, there’s a chase and a fight. Yes, the classic elements are present but, somehow, they lack a true thriller quality. It has a made-for-television feel to it. I know the film was made on a tight budget so not as much time could be taken to get a full cinematic quality to it, but shambling around in the dark is not my idea of getting the job done. Putting all this together, I’m left moderately satisfied. It was good to see flashes of the old Veronica Mars spirit in some of the characters and situations — it’s slightly disappointing there’s not very much character development outside the core players. Summing up, the final evaluation can’t depend on past familiarity. The current mystery element must be strong enough and, somehow, I don’t think this is well enough put together to “hit the spot”. With a little more care, this could have been excellent. As it is, Veronica Mars is only slightly better than average. 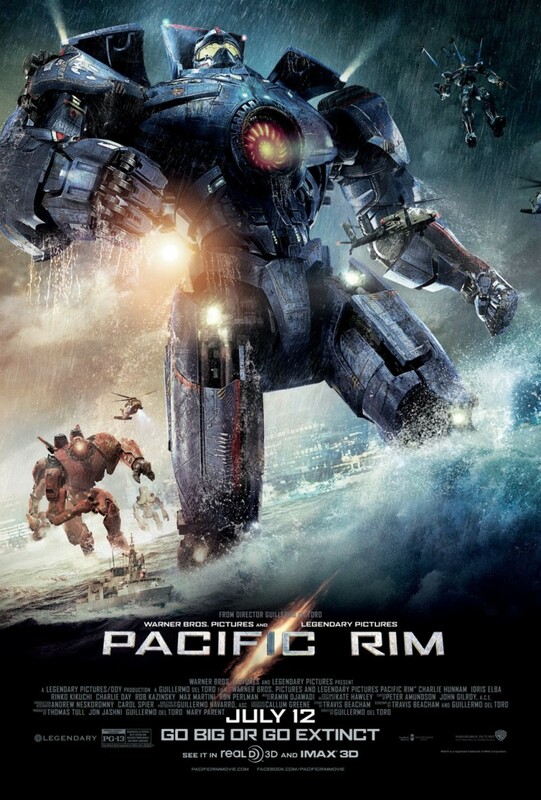 Pacific Rim (2013) reminds us that alien invasions can come from different directions. Conventionally, the pesky beasts load themselves into star ships and fly here. This gives us some time to prepare as our telescopes pick up these large unidentified objects heading in our direction. But, of course, the more advanced aliens can open wormholes and fly between two points in space just by pressing Go. This takes Earth’s defences by surprise and, with such formidable technology to call on, they beat us without waiting to collect the $200 for pressing Go. This film takes the wormhole idea one step further and has an interdimensional door opening in the middle of the Pacific. But instead of the aliens coming through personally, they send through Kaiju, rather large dinosaurs somewhat akin to Godzilla and similar Japanese favorites. They can be beaten using conventional weaponry, but it takes time and while they are being slowly shot to pieces, they do an enormous amount of damage. This seems to be an incredibly stupid way of trying to take over a planet. These aliens have the technology to clone ever larger beasts with great fighting skills. Wy can’t they reverse this process and develop tiny creatures called bacteria or a virus which can be unleashed to kill us all without them having to break sweat (assuming the aliens perspire as opposed to randomly seeping ichor)? From the human perspective, we have a single entry point so submarines with nuclear torpedoes could wait there and kill the beasts as their heads emerge. Polluting the sea is a small price to pay if it saves lives. At this point, it’s perhaps relevant to mention director Guillermo del Toro’s interest in H P Lovecraft. Cthulu lives and dreams in a city deep under the South Pacific. It’s called R’lyeh. Notice the hero of this film is called Raleigh. We may therefore speculate this is the minions of the Elder Gods softening up Earth before Cthulu wakes up and the other Mythos beings arrive. Appropriately, evidence emerges suggesting the aliens tried this before with the original dinosaurs, but the atmosphere wasn’t quite the right mix and they died out before they could clear out the indigenous lifeforms. Now we’ve had several centuries polluting the place, the atmosphere is just right for the larger scale dinosaurs to return. This time the aliens’ monsters will clear off the vermin, i.e. us, leaving the aliens a great planet to call home. Knowing conventional weapons will not keep us safe for long, Earth comes together and builds giant robots called Jaegers. The timing of this is interesting. While these monsters are popping up out of the ocean, we can develop the technology and build these robots in a few months. Yeh, right (sarcasm intended). One person interfaces are not strong enough to control these machines. It needs two minds working together. Brothers Raleigh Becket (Charlie Hunnam) and Yancy Becket (Diego Klattenhoff), were never star athletes but they were compatible when slaved together to drive the robotic Jaegers. Two-person teams like them become rock stars. 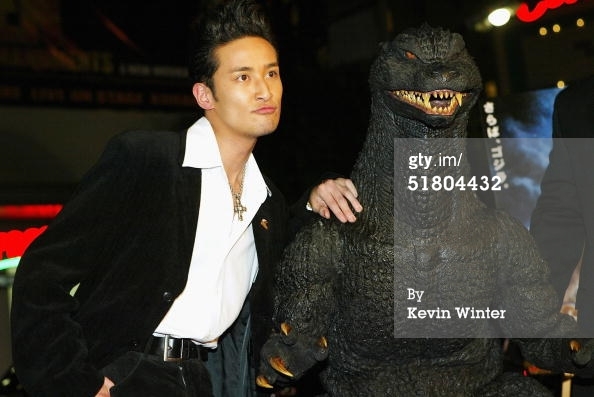 They beat the Kaiju. Life begins to go back to normal. Then a Category 3 Kaiju appears and the game swings back in the aliens’ favour. The brothers are beaten and, while connected, Yancy is killed. This leaves Raleigh psychologically damaged. 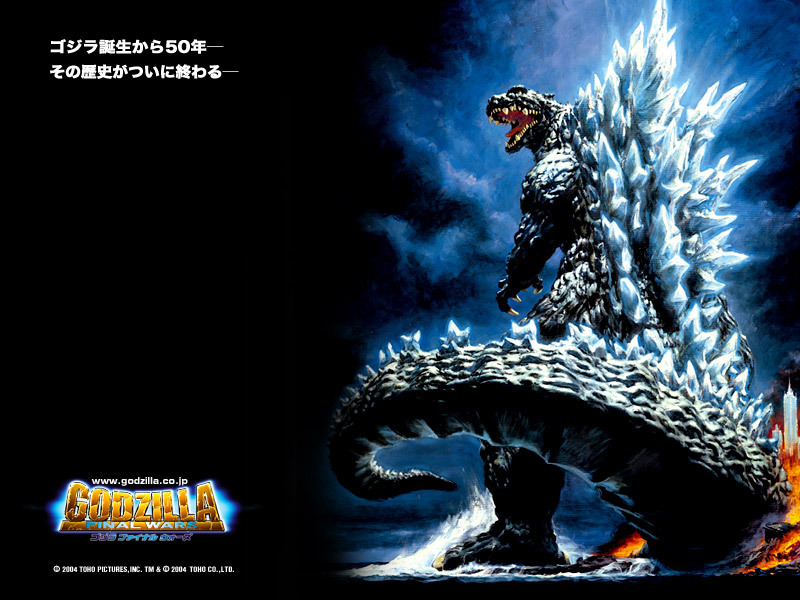 The Kaiju are adapted and start to win more frequently. 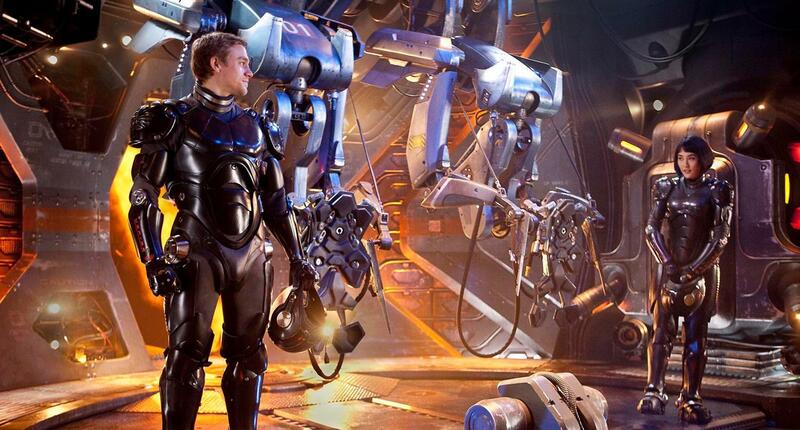 The ranks of the Jaeger are thinned. As is required in films like this, Earth’s politicians decide to build walls around the biggest cities. Hilariously, the elite retreat three-hundred miles inland and leave the rest of the plebs in these more exposed places. Not that this will save the leaders-from-behind, of course. But the elite can delude themselves they will live longer than the masses. The remnants of the Jaeger team are sent to Hong Kong with funding for only eight months. Led by Stacker Pentecost (Idris Elba), they turn themselves into a last chance defence of the city, prepared to take on all-comers. The rest of the cities hide behind walls. Unfortunately with nothing between the monsters and each wall, the beasts can just hit it until it comes down. 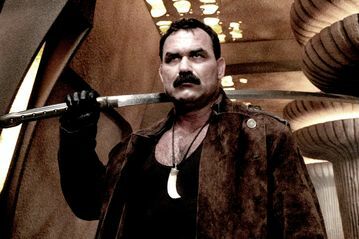 Raleigh Becket is recalled to the front line and teamed up with Mako Mori (Rinko Kikuchi). As a pilot, Pentecost rescued her from a Kaiju attack and raised her as his daughter. Now he’s holding her back until the plot requires him to make the adoptive parental sacrifice. The new partnership has to build trust. After an initial misfire, it’s obvious they will be winners. With Idris Elba to do the recycling of the Shakespearean trope, it’s once more into the breach dear friends as, on St Crispian’s Day, the heroes set off to cancel the apocalypse. OK, so what’s right about this film? Well, some of the CGI is very impressive. There’s a nice attention to detail and a real attempt to give a sense of the mass and momentum of both the monsters and the robots. Unfortunately, that’s all I can say is good. Staying with the CGI for a moment, almost all the scenes are at night and many of the battles are partially obscured by rain or sea water lashed up into the air. I have an interminable list of everything wrong with what we see. Frankly, translating this idea from the far superior anime forerunners like Neon Genesis Evangelion is a robot too far. It’s a problem of perception. When you see these vast machines as anime, it’s easy to suspend disbelief. You don’t have to relate them to real-world physics or metalurgy. You can just sit back and watch the inspirational story of heroism unfold. But the more realistic you make the robots, the more questions you have to answer. Like just what metals go into the manufacture of these machines? 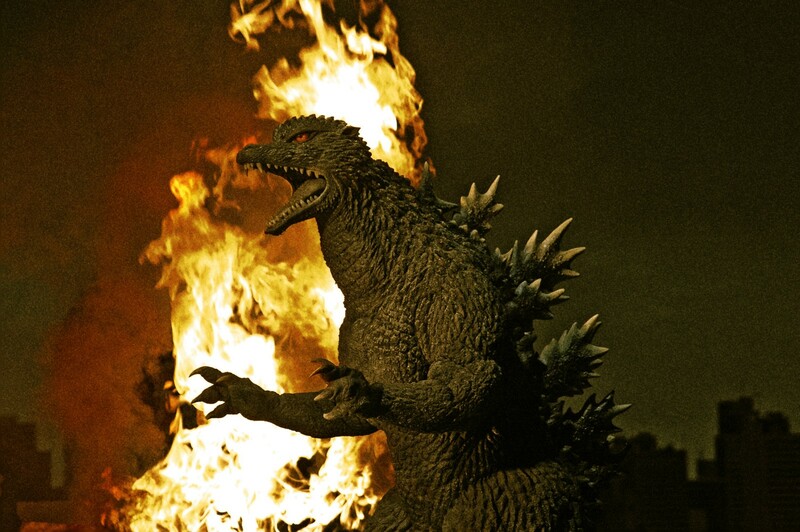 And why do they not get bent out of shape or dented every time a Kaiju taps them with a claw? Yes, they get damaged (eventually), but they get thrown all over the place, crash through buildings and even get dropped from a great height. But they just get up, dust themselves down and start fighting again. And they are all atomic powered? What’s the risk of having them fight inside a city? Even if they don’t blow up, damage could spread radioactive fuel and leave the area uninhabitable. No, wait. They fight in the sea so leaks of the fuel just kill all the fish we eat. And how can a couple of helicopters can pick one robot up and drop it into the shallow sea without breaking it? And why is the seabed always flat when the robots go into battle? And later they are like submarines that can swim down to the bottom of the Pacific without the pressure crushing them? And is that supposed to be an oil tanker being carried as a weapon by one of the robots? I don’t think so! Integral to the plot is Hannibal Chau (Ron Perlman) not quite named for his appetites, who harvests everything useful from the fallen Kaiju. Killing the beasts is good business for him and the Asian men who pay vast amounts of money for Kaiju parts as aphrodisiacs. Initially the scientist double act is there for light relief. Meet Dr. Newton Geiszler (Charlie Day) the let-me-talk-to-its-brain guy and Gottlieb (Burn Gorman) the math wonk. But later they prove essential. As to the technology on display, the drift or neural bridge is quite an interesting idea. Two minds slaved together — think left and right brain — to control the robot. The question, of course, is how the minds stay focused on the job in hand and avoid becoming immersed in memories or other primal urges. Now back to the scientists. If a human was to mind-meld with a Kaiju, that would be a two-way link — not that the aliens would need to know much about us. In this, the baby Kaiju is an amusing touch with two scientists sharing the load to get the inside dope. This leaves me disappointed. It might have been possible to craft a good story on this theme of monsters vs. robots, but it certainly didn’t appear on the screen. At 130 minutes, the whole thing just takes too long with the human interaction not strong enough to fill in between the set-piece battles. 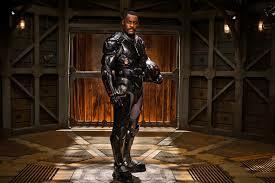 I suspect even the fanboys are going to find Pacific Rim heavy going.